Published as an appendix in: D.Urošević, T.G. Pannuti, N.Duric and A. Theodorou "The Σ-D Relation for Supernova Remnants in Nearby Galaxies", Astronomy & Astrophysics, vol. 435, p. 437. Table 1. 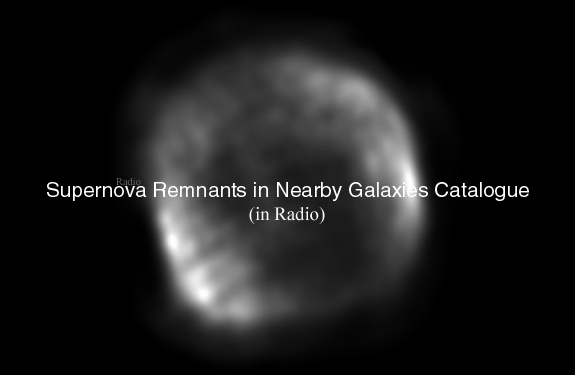 General Properties of the Nearby Galaxies with Radio SNRs.  NED Database;  Tully 1988; a Filipoviċ 2002; b Freedman et al. 2001; c de Vaucouleurs 1979; d Puche and Carignan 1988; e Sakai and Madore 1999; f Israel 1988; g Tarchi et al. 2000. Table 2. Resolution and Sensitivity for Searches for Radio SNRs in Nearby Galaxies. Table 3. The basic quantities for 148 SNRs in nearby galaxies. a S20 has been extrapolated from the values listed for α and S36 by Filipoviċ et al. 1998b. b No spectral index data available; a value of α = 0.5 is assumed. c S20 has been extrapolated from the values listed for α by McDonald et al. 2002 and S3.6 by Huang et al. 1994. D The flux densities are from the paper by Dickel and Milne 1995.
e S20 has been extrapolated from the values listed for α and S18 by Tarchi et al. 2000. LMC & SMC -- at 1400 and 1420 MHz, respectively (Filipoviċ et al. 1998b); M31 -- at 1465 MHz (Braun and Walterbos 1993); M33 -- 1420 MHz (Gordon et al. 1999); IC 1613 -- at 1460 MHz (Lozinskaya et al. 1998); NGC 300 -- at 1450 MHz (Pannuti et al. 2000); NGC 6946 -- at 1450 MHz (Lacey et al. 1997); NGC 7793 -- at 1470 MHz (Pannuti et al. 2002); M82 -- at 8400 MHz (Huang et al. 1994); NGC 1569 -- at 1400 MHz (Greve et al. 2002); NGC 2146 -- at 1600 MHz (Tarchi et al. 2000).